Dr. Valerian I. Tatarskii is a Senior Scientific Researcher for Radio-Hydro Physics, LLC, a scientific research facility that specializes in the theory of wave propagation in random media, which served as one of the important components in engineering projects in atmospheric optics, radar, laser communications, and astronomy. Dr. Tatarskii, a scientific research expert, conducts studies on wave scatterings from the ocean surface, and his findings have served as supportive evidence in environmental investigations, and contributed to major developments and advancements that have been made. With a wealth of knowledge and experience as a scientific researcher, scientist and author, Dr. Tatarskii shines in his capacity after having spent more than 54 years conducting scientific research and building on an ever-emergent skill set, which allows him to make valuable contributions to his field. He has published three books on the effects of the turbulent atmosphere of wave propagation, and, with a profound and growing understanding of these effects, Dr. Tatarskii has been honored as a Professional of the Year in Scientific Research for his outstanding efforts, and he continues to strive for excellence in his every endeavor. The three books that Dr. Tatarskii has had published have had a lasting impression on the geophysical arena; his titles are as follows: “Wave Propagation in a Turbulent Media” (1959 in Russian, 1961 and 1967 in English), “The Effect of the Turbulent Atmosphere on Wave Propagation” (1965 in Russian, 1971 revised edition in English), and, in co-authorship with S.M. Rytov and Yu. A. Kravtsov, “Principles of Statistical Radiophysics” (1978 in Russian, 1989 in English). 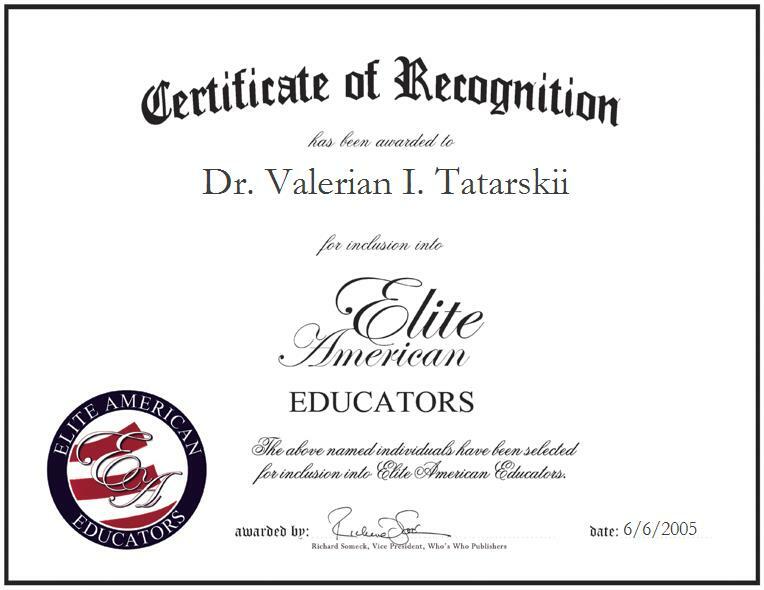 Dr. Tatarskii has garnered a reputation of distinction from his professional peers for his unrivaled determination to have a positive impact on the world through rigorous scientific research. In 1991, Dr. Tatarskii received the USSR State Prize, and in 1994, he was honored with the Max Born Award by the Optical Society of America. He remains abreast of trends and developments in science as a member of the Institute of Physics of UK, the Russian Academy of Science, the USA National Academy of Engineering, and the Electromagnetic Academy of MIT. He is also a fellow of the Optical Society of America.